250 SQF difference but same “room count”? 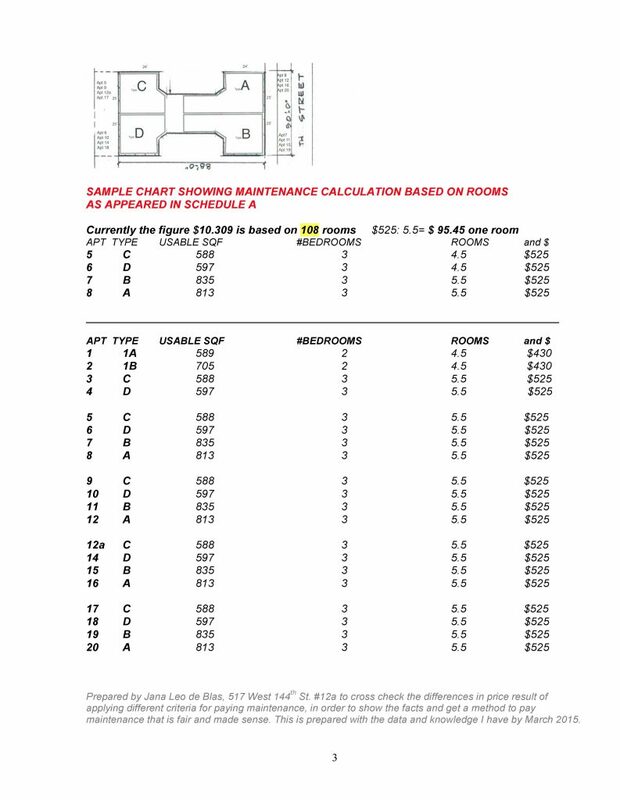 2- Maintenance charges is paid based “room count”. Smaller apartments are paying the same maintenance than larger apartments because they have the same “room count”. 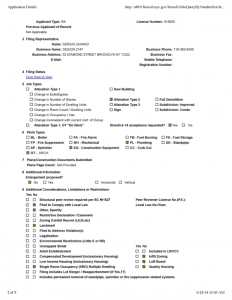 3-There is a chart “Schedule A” that reflects the number of rooms, payment and shares. The room count is wrong. 4- Interior apartments (3, 5,9,12a,17 with 585 SQF and 4,6,10,14,18 with 613 SQF) are much smaller than exterior apartments (7,8,11,12,15,16,19,20,) with 835 SQF but pay the same maintenance. 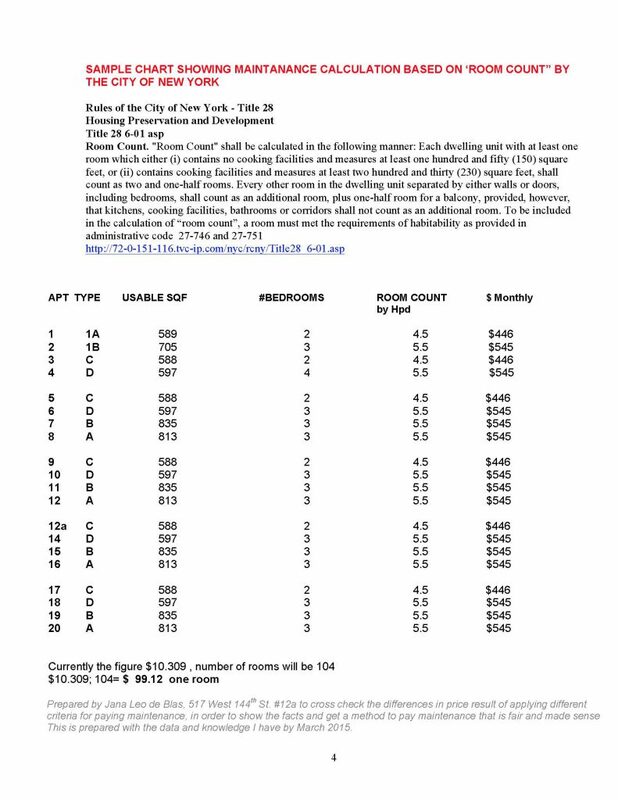 Pay maintenance by “room count” ($520 monthly aprox $90 per room) and 18 apartments pay as 5.5. However, the interior apartments that appears as 3 Bedrooms (5.5 rooms) are in reality 2Bedroom (4.5 rooms). How can be possible that apartments with over 250SQF difference have the same room count. The size of an apartment can be measured with square feet or counting rooms (“room count”). But the “room count” is not a reliable unit to measure space. During the building renovations (1997) the room count was messed up. One architect Gilbert Dias did the interiors (Job 1009112XX), and another Paul Castruci (Job 1016660XX) did the exteriors. Before the renovations exterior apartments have a living room, a dining room, a kitchen and a bathroom plus 3 bedrooms; interior apartments have a living room, a dining room, a kitchen and a bathroom plus 2 bedrooms. After the renovations exterior apartments merged the living room with the dining into a single room (of 287 SQF), but in interior apartments the dining room disappears and was called a bedroom and the living rooms has only (130 SQF). Suddenly interior apartments have (5.5 Zoning rooms). 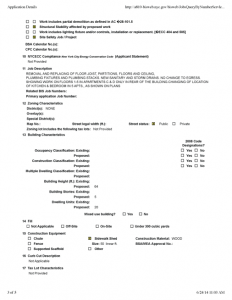 Also the Certificate of Ocupancy must be changed when there is a change in room count, but no CO was filled. The room count after renovations don’t follow the rules: “Room Count” shall be calculated in the following manner: The basic living space in a dwelling unit (a living room, dining area, and kitchen and bath) counts as 2 1/2 zoning rooms and every other room shall count as an additional room. There are rules of the minimum size for the dwelling unit over 230 SQF. 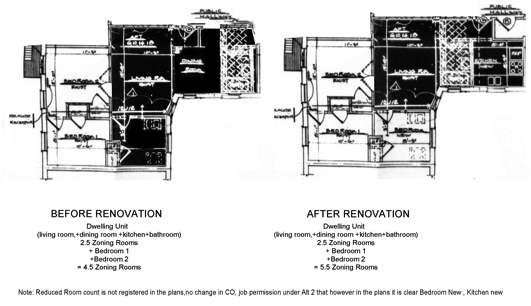 Irregularities on the plans for renovation. 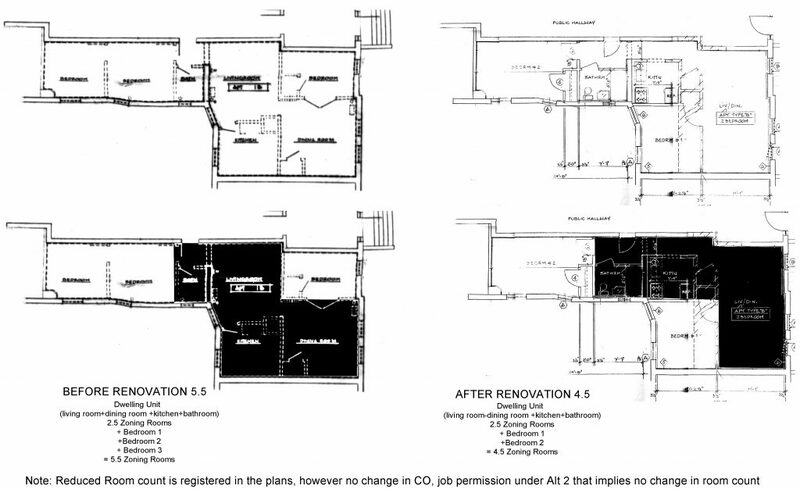 Alt 2 renovations with no change in room count, but the job was filled under Alt 1 when in reality should be filled as Alt1, that implies change in room count. – The dwelling unit attends the space not at its distribution: an open plan (kitchen, living room and dinning-room into the same area with no walls), or a close plan (walls to separate the kitchen from the living room or dinning area) have the same number of zoning rooms. When doing renovations in apartment, to close or open the kitchen don’t change the ZR. If the renovation change the use of a room (for instance before was a dining room or a kitchen but the plan was changed and now it is a bedroom the walls with in the Dwelling unit, the room count is not changed. – The dwelling unit looks at the use (program), whether the room is use for sleeping or dining is more important. When doing renovations in apartment this is a crucial point. Using the dining area as a bedroom change the number of zoning rooms. 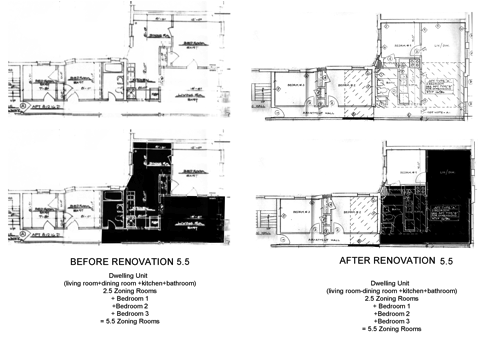 To convert the kitchen into a bedroom changes the zoning rooms. 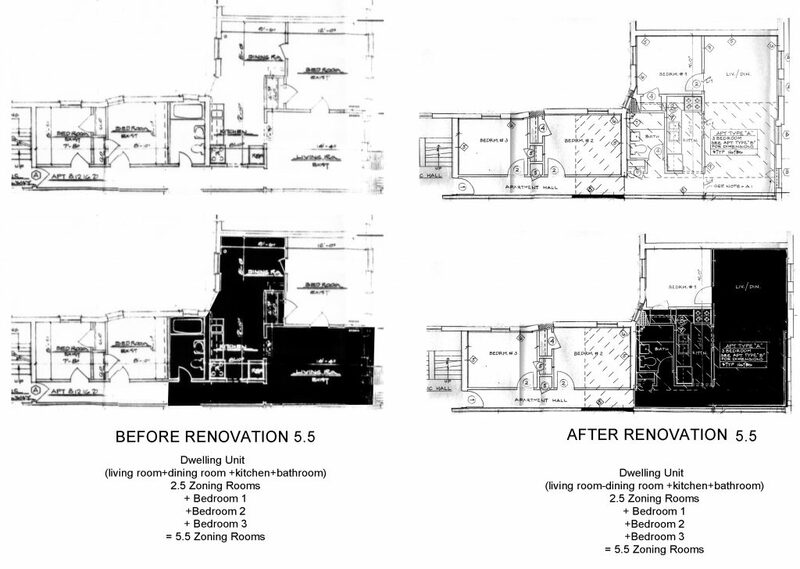 The size of the separation between two rooms changes the number of zoning rooms. The building was sold and became a coop after renovation. 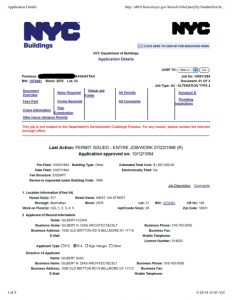 In the Job title the client is the city of New York. HPD supposes to be checking the accuracy of all info before sent to contract. 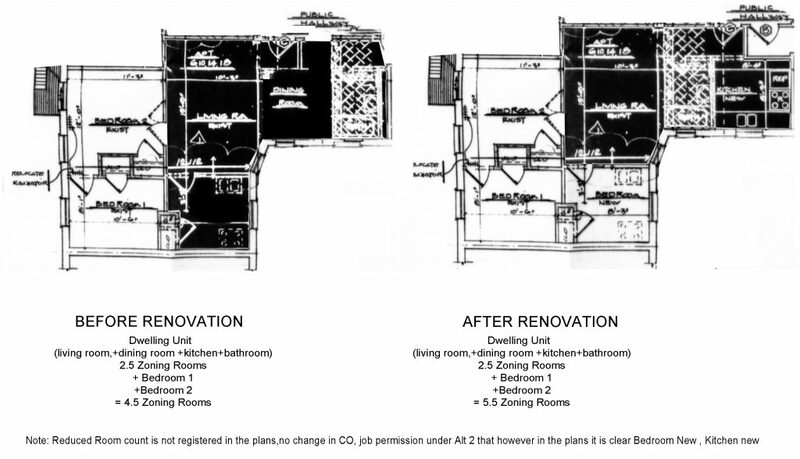 Splitting from the same origin, the dwelling unit, (a living room, dining area, and kitchen and bath) the two ways in which a room is defined (Zoning room or room count) depends of the purpose of defining (structural or financial). In other words, it is the purpose what defines what is a room. Chapter 2: Construction of Language and definitions. (1) Kitchens or other cooking spaces (without limit as to size) should not be counted as “living rooms”. (2) Dining alcoves, dinettes or other dining spaces (without limit as to size) when not separated by walls or doors from other “living rooms” or cooking spaces, should not be counted as “living rooms”. 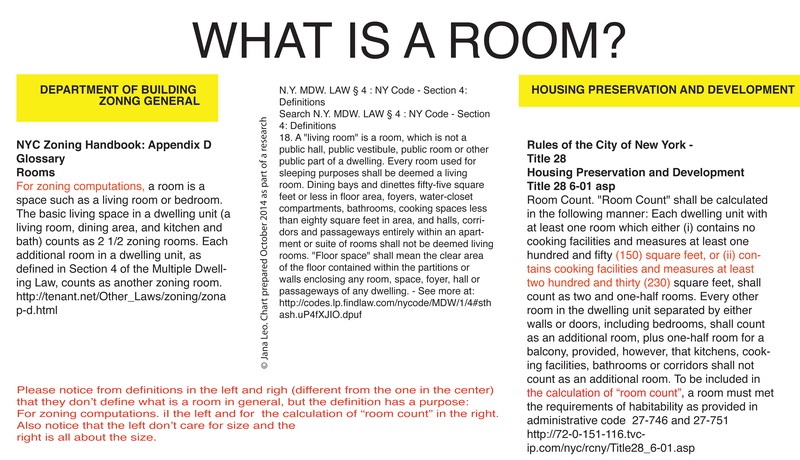 (3) Dining rooms in dwelling units containing three or more bedrooms, and one or more other living rooms as herein computed shall not be counted as “living rooms”, except that such dining rooms may be counted in determining the degree on non-compliance under the provisions of Section 54-31 (General provisions). The number of rooms in a rooming unit shall be counted as two. 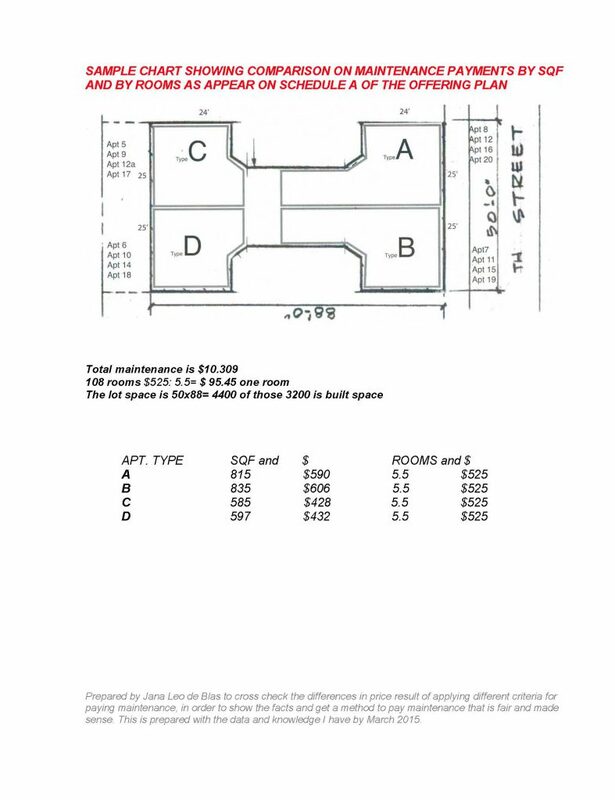 In contrast with the definitions above “for the purpose of complying with the lot area requirements” the one bellow “for the calculation of “room count”. Over a thousand HDFC buildings constituted between 1992 and 2003 have the wrong “room count” in their Schedule A. 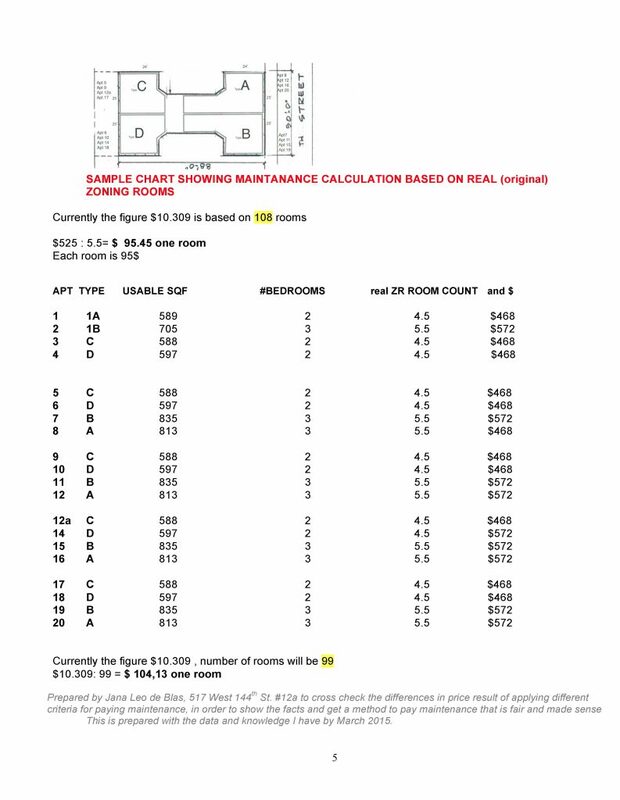 The first time I asked officials from HPD about how rooms are counted for maintenance and the reason for half units such as 4.5 or 5.5, I was informed that each room counted as one and the bathroom counted as half. Looking at the plans, I felt that this was not a full explanation, which prompted deeper research on the “room count” issue. During the two-year course of my research, I looked at Schedule A in the offering plan of a building and I looked at the plans of that building before and after renovations. 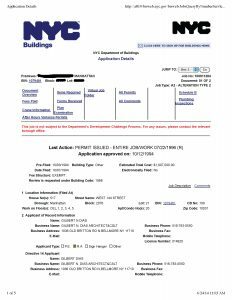 I can say with certainty that there was a match to the “zoning rooms” after renovations in the plans that I obtained from the Department of Buildings and the “room count” in Schedule A that that building was using to calculate maintenance. 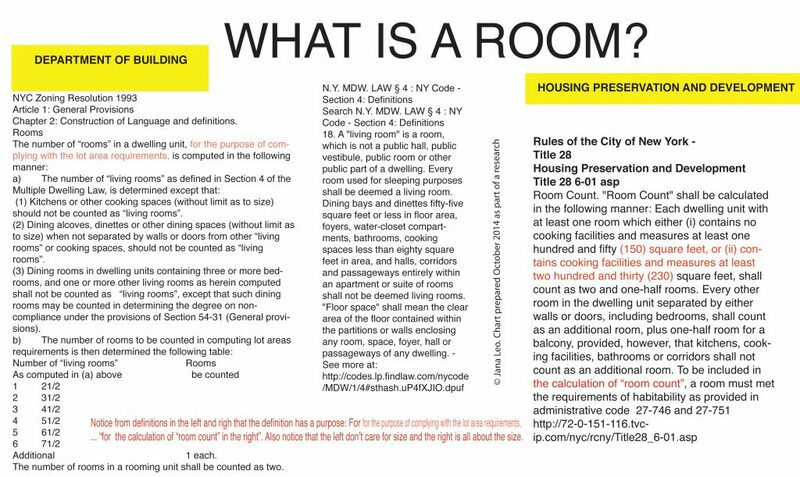 After the meeting with the DOB commissioner who clarified that “zoning rooms” don’t measure space,” I went in a different direction, looking again for the definition of a “room.” After another year of further research, I made a major discovery: room is defined by its intended use or purpose. 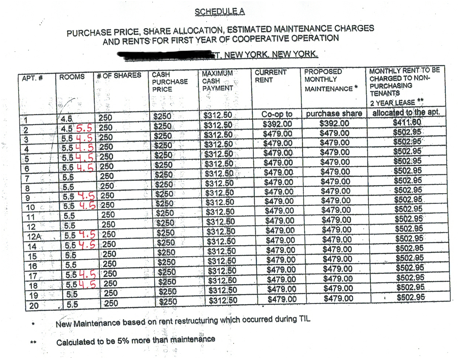 Despite the fact that “room count” is defined in title 28 by HPD, and whether or not the purpose is different, when HPD did the calculations for Schedule A for HDFC, the “zoning room” from the Department of Building was used automatically to determine the “room count.” HPD didn’t use the right rules to measure rooms in HDFCs. As a result, all HDFC buildings constituted between 1992 and 2003 have the wrong “room count” in their Schedule A. The main principle is that maintenance should be proportional to the size; whether the size is measure by room count or SQF the result should be equivalent. But is not, look at the charts with the different calculations. Quite often, one finds different size apartments paying the same maintenance. For example, in one such building I’ve examined, there exists a 600 square foot apartment and a 800 square foot apartment, both with the same “room count” and, therefore, paying the same maintenance. Because smaller apartments tend to be less expensive and are frequently purchased by people with lower incomes, and, conversely, those with higher incomes purchase larger apartments, the resulting low-income wage earners subsidize the maintenance of the residents with higher incomes. 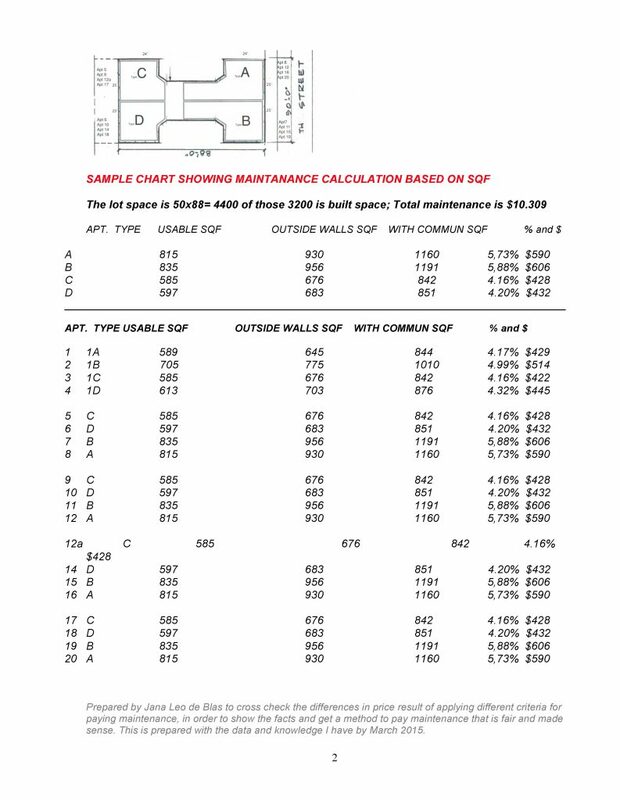 Evidence in support of this observation can be found by cross-checking charts in a building that is paying by room or by square foot: please see a sample chart showing maintenance calculation based on “room count” as appearing in the Offering Plan (Schedule A) for the building and another sample chart showing maintenance calculation based on square foot. For instance, a small apartment with the current “room count” calculation pays $525 but would pay $432 if paying by square foot; a large apartment with the current “room count” calculation currently pays $525 and will pay $606. F) What a lawyer have to say? (2) Shares must be allocated in whole shares. (3) Detailed footnotes must support and explain the information in Schedule A.
sufficient to refer to the industry standard employed. H.F.D.C. the sponsor is a commissioner of the Department of Housing and Community Renewal. (d) did not have knowledge concerning the representations or statement made.